Becoming rich requires no miracle and no magic; only the knowledge and application of basic natural Laws, ancient Wisdom, common Secrets, biblical Truths and spiritual Principles that govern Life, Money and Success. This Knowledge is Key, and a powerful tool in the hands of those who know and faithfully apply it. 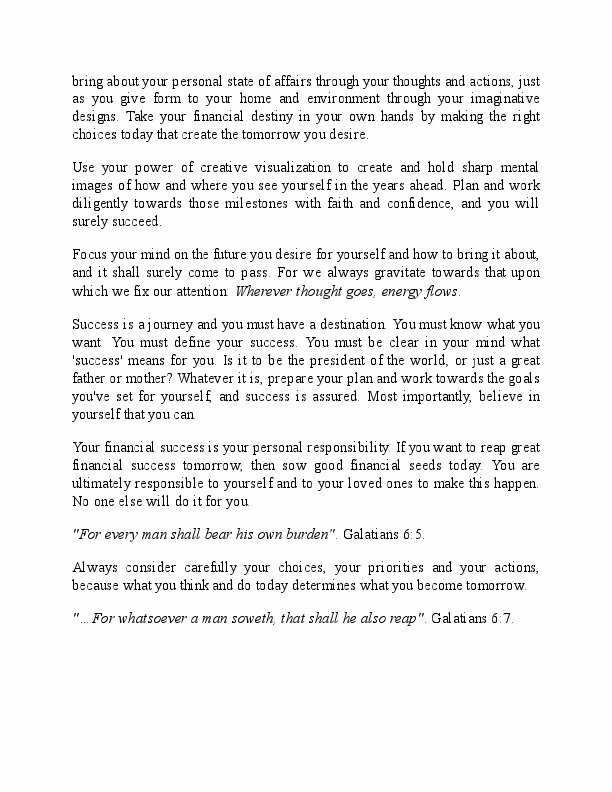 The 'WEALTH SECRETS' presents to you the secrets that have over the ages propelled ordinary men and women like you and I unto superior heights of personal success, fame and fortune. Quickly place yourself on the golden path to Wealth and Power by aligning with these immutable principles that govern Life, Money, Success and Prosperity. That briefly, is what this book will do for you. Drink from this cup and thirst no more! 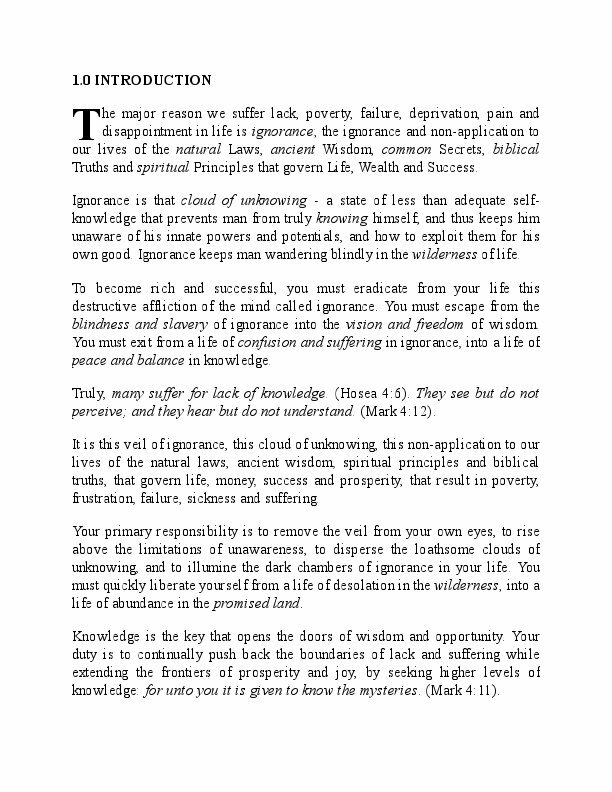 The major reason we suffer lack, pain, poverty, failure and disappointment in life is ignorance; ignorance of the natural Laws, ancient Wisdom, common Secrets, biblical Truths and spiritual Principles that govern Life, Wealth and Success. 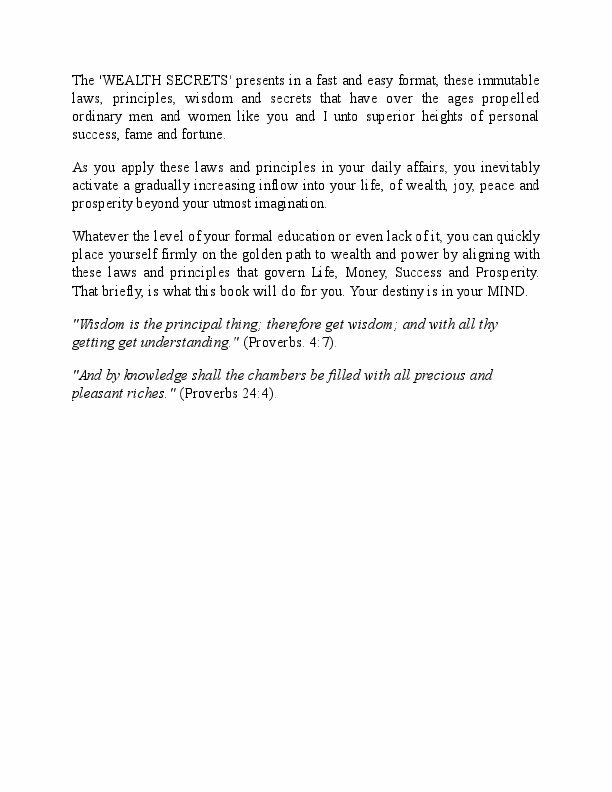 The "WEALTH SECRETS" presents to you, in a fast and easy to read format, these immutable laws, principles and secrets that have over the ages propelled ordinary men and women like you and me unto superior heights of personal success, fame and fortune. When you apply these laws and principles in your daily affairs, you automatically activate a gradual but steady inflow into your life of wealth, joy and fulfilment beyond your utmost imagination. 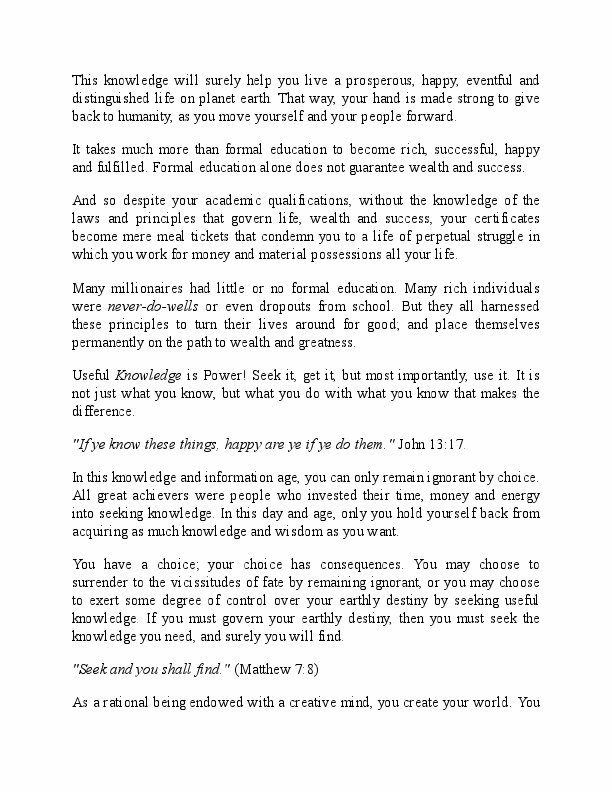 Whatever the level of you formal education or even lack of it, you can quickly place yourself firmly on the golden path to wealth and power by aligning yourself with these laws and principles that govern Life, Money, Success and Prosperity. That briefly, is what this book will do for you. 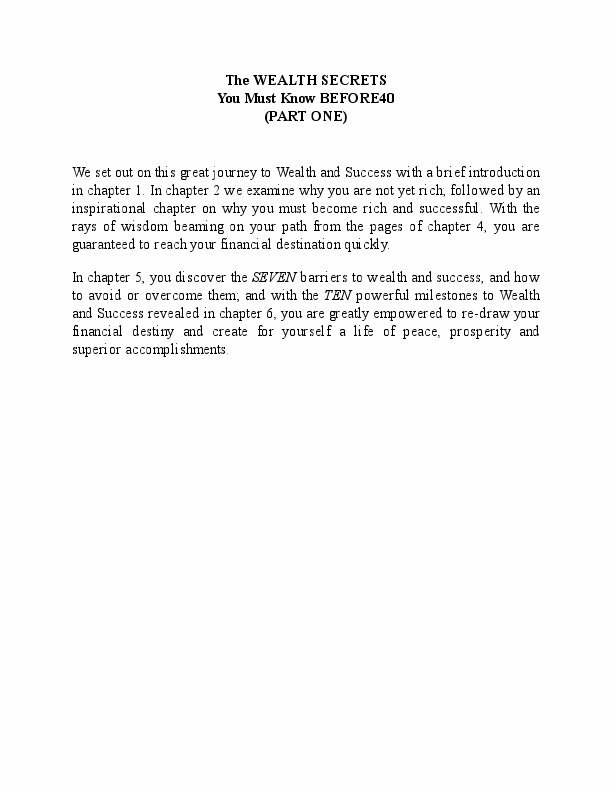 We set out on this great journey to Wealth and Success with a brief introduction in chapter 1. 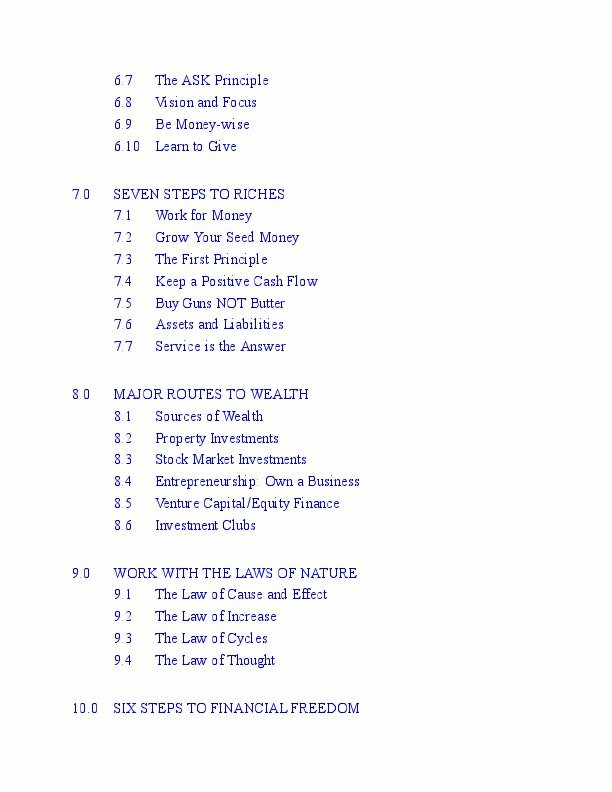 In chapter 2 we examine why you are not yet rich; followed by an inspirational chapter on why you must become rich and successful. With the rays of wisdom beaming along your path to financial freedom from the pages of chapter 4, you are sure to reach your financial destination quickly. 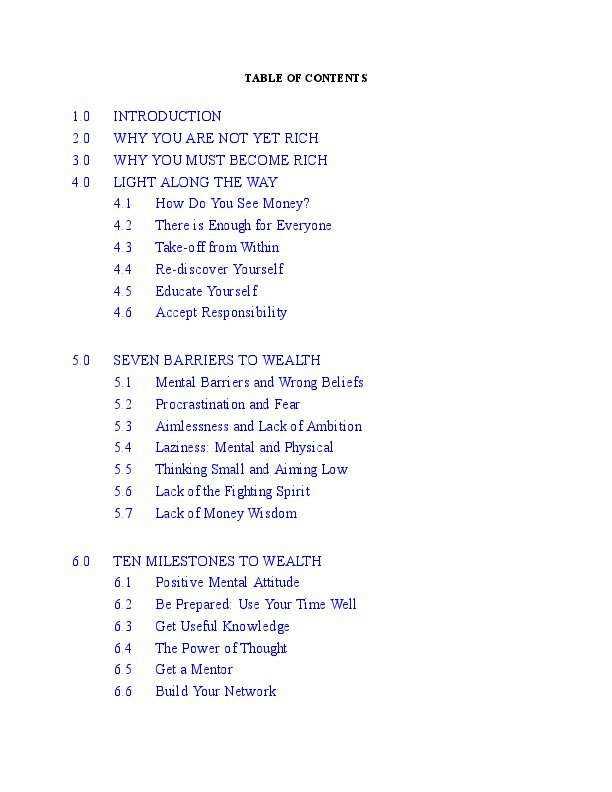 In chapter 5, you discover the SEVEN barriers to wealth and success and how to avoid or overcome them; and with the TEN powerful milestones to Wealth and Success revealed in chapter 6, you are greatly empowered to re-draw your financial destiny and create for yourself a life of prosperity and superior accomplishments. 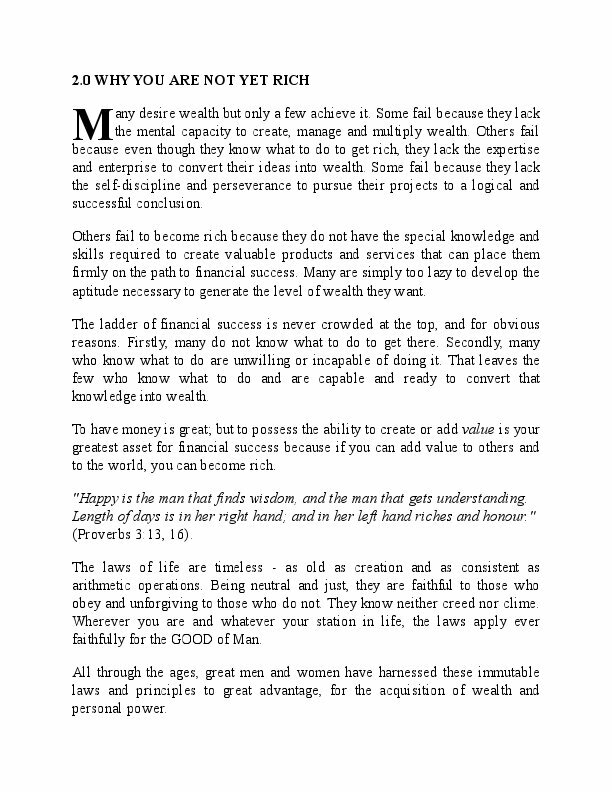 Your journey to Wealth, Wisdom and Success continues in part two of The WEALTH SECRETS with a revelation in chapter 7, of SEVEN simple, potent and practical wealth nuggets that will empower you to take firm definite steps towards riches. 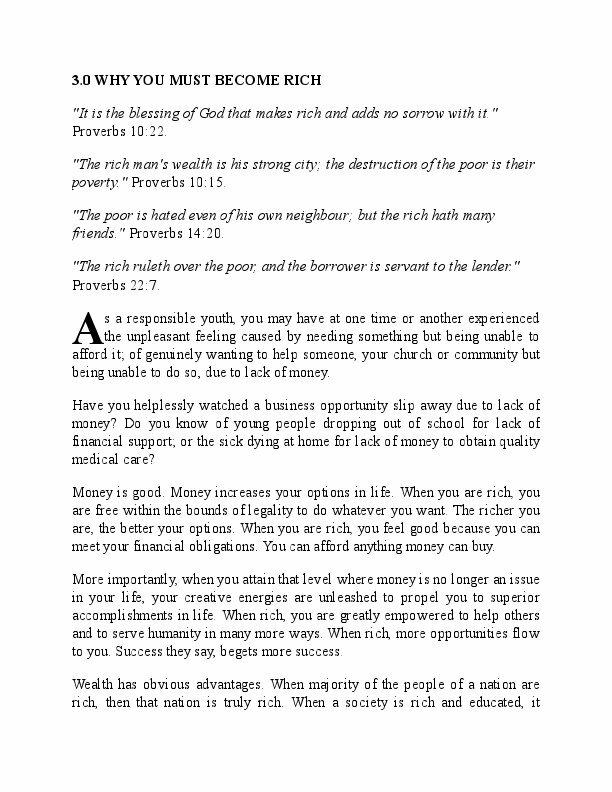 In chapter 8, we review the major routes to wealth and how you can use them to create your financial reservoir. In chapter 9, you learn to conquer Nature, not by resisting her forces, but by obedience to her laws. We explore the law of Cause and Effect, the law of Increase, the law of Cycles, the law of Thought, and the laws of Money; and how to use them to achieve your professional, business and financial goals. 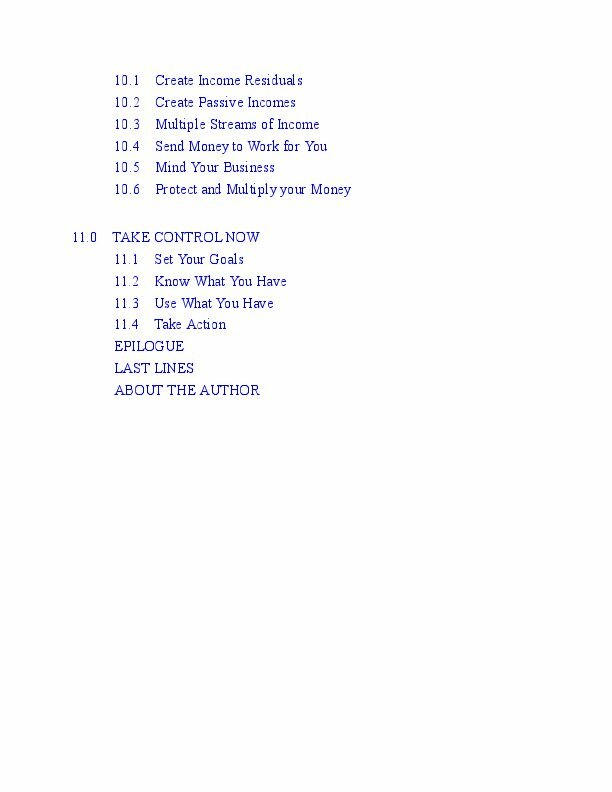 Chapter 10 reveals SIX practical steps you must take to protect your wealth and ensure an irreversible financial status for yourself, your family and loved ones. The powerful revelations in chapter 11 will surely provoke you into action - to take full control of your life and make your dreams come true! "And by knowledge shall the chambers be filled with all precious and pleasant riches". (Proverbs 24:4). Your destiny is in your MIND. Drink from this CUP and thirst no more! See you at the top! Educated in UK and Nigeria, Jay holds degrees in Estate Management, and in Surveying/Geodesy. Jay is a motivator and friend of Youths; and founder Before40 Youth Empowerment Foundation for Better Citizenship. He lives at Aba with his gorgeous wife and enjoys reading, writing and gardening of rare and exotic plants.